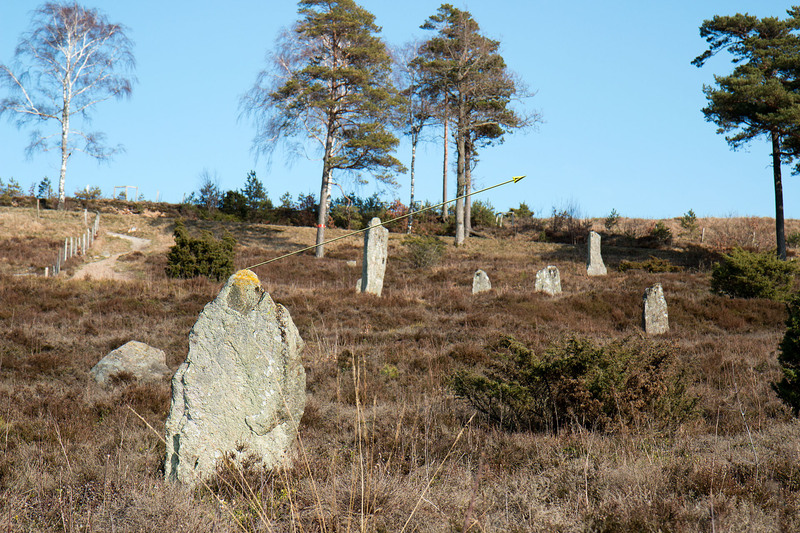 The stones show the point on the horizon where the sun rises at the day of the new quarter in spring. The distance between the stones is 41m. The animation shows the day of the new quarter based on the spring equinox as defined by 1) Height Model Equinox and 2) Refraction Equinox. See definitions in Days-of-the-calendar. The higher stone has has a shape of its top where the solar circle exactly fits. The sun’s path is exactly right compared with the stones 28 days after the spring equinox, defined as the day before spring equinox according to today’s definition. (“refraction equinox”). The sunrise on the on the day of the new quarter can be seen today. The next date on which this will occur is April 17 2015, 7:20.